The QKORE component is a passive grounding device that distributes artificial, “clean” earth for every audio component in a sound system. The unit uses an electrical as well as a mechanical approach to achieve this. 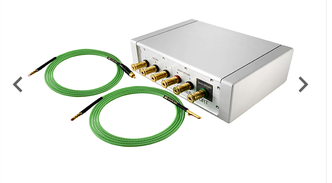 It’s a rather uncommon component that integrates Nordost’s patented monofilament technology with purpose-built, low-voltage “attractor plates (LVAPs)” which are constructed with a proprietary metal alloy and a passive electronic circuit. The design’s function is to draw stray high frequency noise and voltage-generated magnetic fields to its artificial ersatz earth point, thus leaving a “clean” reference thereafter. The Audio Observer returns to The Inner Ear and discusses in depth, the Bryston Mini-T Active speaker system as part of a complete Bryston Active System. Bryston’s most ambitious audio products to date are not only their hefty power amplifiers, loudspeakers and digital electronics, but also their no-holds-barred active system designs for the Model T, the Middle T and, my favourite, the Mini T under review here. A few months ago, when I first auditioned the new Bryston 4B-3 amplifier in my system, I was instantly taken aback by what I heard and almost immediately speculated about the sonic quality of a the new 7B-3s. Why? Well, because I have had the 7B series 2 in-house for quite some time, and consider myself intimately familiar with their sonic characteristics. 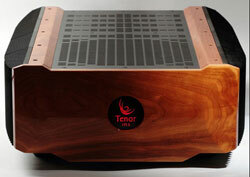 I wondered, no, I became somewhat anxious to hear the new Cubed Series 3, 600-watt mono blocks. It took a while to get a pair of the new ones, but after patiently waiting, I now have them — connected and playing for about three weeks. 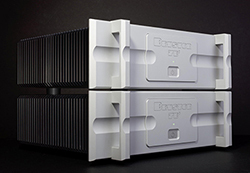 I have followed the developments of Bryston products for about 30 years, reviewed most of them and therefore decided that, at age 80 and mainly retired, I'd take one more look and listen to the new 4B amp of the recently introduced series which Bryston calls Cubed. A while ago, Inner Ear Editor Erne Fisher wrote a "Short & Sweet" review of the Bryston Mini-T loudspeaker. We just received this review from Allen Edelstein, gave it a read and found it to be a very interesting take on the Mini-T and thought we'd post it Allen Edelstein. Click the link to read the complete unedited review - probably the longest review we have ever published over the last twenty-five years. We hope you enjoy it. :exceprt: Although Bryston has been in business for almost half a century, it has made speakers for only a few years. And in North America producing both electronics and speakers is rare. Few companies have made a real go of it, trying to do both for a while and usually reverting to only producing their original product. 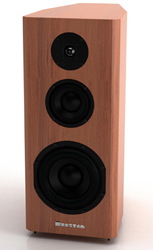 But given the rate that Bryston has been releasing new speakers I can only assume success in this case. We are also finding that some want it short and sweet so the writers at Inner Ear Magazine are taking a new direction and will soon present Audio: Short & Sweet Reviews. Consider them to be an introduction, immediate impressions, a "getting to know you" of new equipment. Detailed reviews take time – and that is important in the overall assessment, but these days, when equipment changes happen in the blink of an eye, we feel it is right to get our impressions to you sooner. In the professional audio industry the name Nagra is synonymous with precision. For over 50 years, Nagra has been an industry leader in developing analogue and digital audio recorders. Famous for their sound quality and reliability, Nagra recorders have been the first choice in high-quality recording equipment for a generation of location sound recordists and engineers. My personal introduction to Nagra came in 1992. I was a young film studies student at the time, and had my first taste of high quality pro-audio in a lecture on the Nagra III NP analogue audio recorder. I spent many subsequent hours with the Nagra III, studying its operation, taking the recorder out for field recording sessions, and performing a series of recordings for short film projects with other students. That early time with the Nagra III, where I explored the nuances of recorded sound, was instrumental in my movement into audio as a professional. Inner Ear Editor Ernie Fisher started out conducting some listening tests and ended up drafting an essay which consders the consciousness of critical listening. The motivation for this essay was his earlier listening experiences while auditioning the Tenor monoblocks (350M) a few years ago and the past year spent with the 175S — Tenor’s less expensive stereo model amplifier. There was a lot to tell taken from notes written over a rather long time period — that best describes what he have observed and noticed. The following is based on the 175 S Tenor amplifier being connected to many loudspeakers he had in-house and at other locations — and a few different preamplifier (sadly not the Tenor) and source components. A High Performance Music System For Under $10K. Inexpensive audio systems are the grist for the mill of this old reviewer. Low-priced components, however, represent many hours of hard work of others who create the components for them. In the meantime, I may have spent years surrounded by free (though temporary) high-end audio gear from Tenor, Bryston, Genesis, Avantgarde, and am prone to dismiss these efforts if what I hear doesn't match my preconceptions. Of course, if I had to pay for the audio gear, things may be different . The Mini Ts do a better job of providing solid bass than any other so-called bookshelf speakers I have encountered at or close to their price range. They can produce or reproduce a true 35Hz at low to moderate volumes with excellent control, whereas most speakers in this price range either give up well above 40Hz or wind up with serious boominess. As the sheer size and number of drivers indicates, the Model Ts do not make polite compromise with the law of physics. However, the size and number of driver is a bit misleading as the Model Ts are very coherent. If you believe that high-end audio is always expensive, you are right — most of the time. There are, however, some, or few exceptions. These monoblocks cannot be considered outright bargains, but when one considers the price/performance ratio, one of the few exceptions is this pair of amplifiers from Bel Canto Audio. The price may point toward shortcuts taken to reduce costs, but that simply isn’t so. The company and its designers have a sound background in engineering and they have gone to great lengths to create electronic components employing the most recent and innovative advances in switching technology. While this is important, Bel Canto haven’t forgotten about the music their designs must recreate; after all, loosely translated, their name translates into Beautiful Song from the Italian language. As we shall see when you read the following, there is evidence that the components under review are capable of reproducing just that. In the world of no-holds-barred multi-channel audio, the Bryston SP3 is the pre-amp / processor to beat. In essence, the SP3 is three great products in one. It offers the best multi-channel audio I’ve ever heard outside of a top sound mixing studio; it includes 7 outstanding D/A converter channels for multi-channel or stereo digital audio; and it provides outstanding 2-channel stereo performance, essential to any truly great sound product. As the culmination of the progression Bryston has undergone as a company, the SP3 tops their list of exemplary consumer electronics products. Unlike the amplifiers Bryston produces, it’s not likely the SP3 will find its way into very many sound studios (some, but not as many). However, given the performance level attained, it is capable of bringing the highest studio caliber sound into your home. I’m suspicious that this particular review started out as a challenge, that after reading my original review of the Origin Live Calypso and Encounter combination, Mark Baker was curious to see how I would respond to one of his top arms. 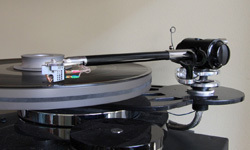 In the spring of 2011 I wrote a review of the excellent Origin Live Calypso turntable with the equally striking Encounter MK3C Tonearm. I spent a good number of months with both products and was thoroughly impressed with what I heard – so much so that after the review I asked Origin Live’s principle owner and designer Mark Baker if I could set up the combination for The Inner Ear's editor Ernie Fisher for an extended run of additional listening. After a brief conversation, rather than returning the whole kit, Mark suggested we up the ante and offered to send an upgraded tonearm to be paired with the same Calypso table. His recommendation was the Conqueror MK3C. 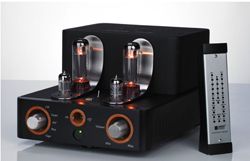 "At the outset, let me clearly state that I am a proponent of tube audio as opposed to solid-state audio gear. Having exposed my subjective preference in terms of music presentation, I can unabashedly continue with the following phono stage review. By way of a little background, I have been an audio enthusiast for the past 35 years. I have a fairly large collection of both records and CDs, which cover a number of musical genres. The journey to try to achieve audio bliss has been an exercise in trial and error, but also, for the most part, a great deal of fun, with the occasional hiccup along the way. Recently my audio friend David McCallum approached me to inquire if I'd be interested in doing some writing for the high-end Inner Ear audio webzine. David and I both share the love of audio and also have similar tastes in two channel stereo equipment." About The Inner Ear – A little background, philosophy and mind-set. E. Leopold gets on his soapbox to discuss "Editor's Choice".